A properly installed fiberglass roof also known as GRP Roofing, will last for at least 30 years with no measurable deterioration. Flat roofs are notorious for succumbing to leaks. If you have flat roof that is made of felt you will probably be aware that your flat roofing will eventually become brittle and start to degrade, which will inevitably lead to leaks and probable damage to ceilings and if goes unchecked for long enough water ingress will eventually damage walls, carpets, floors and furniture. In an attempt to keep costs down, some home owners choose to replace the felt on their old felt roofs with similar felt. We are more than happy to carry out this work for you however we recommend using more advanced materials that will last a lifetime. The flat roofing materials Highland Roofing Contractors use are so advanced and efficient we can guarantee your GRP fibreglass roof will be waterproof and leak free for life. Highland Roofing Contractors provides both domestic and commercial flat roof installations and repair services. 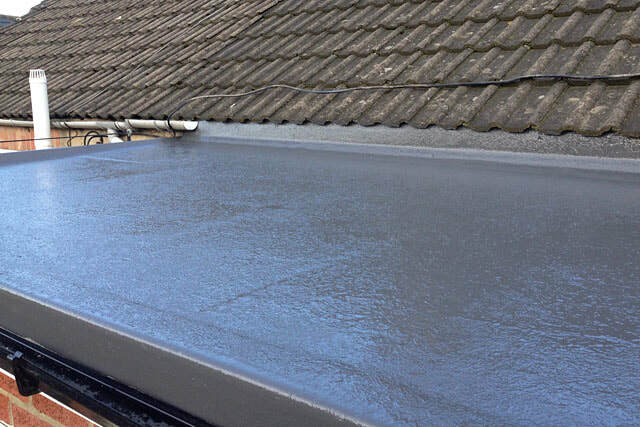 If you have an old flat roof that you suspect is leaking, then contact us and we will be more than happy to meet with you and discuss if you’re best and most cost effective option would be to repair your existing roof or install a new GRP fibreglass roof. GRP Roofing | Fibre Glass Roof installation | Fibre Glass Roofing.